In addition to the electric version of the 500, Chrysler will display in Detroit the entire Fiat 500 lineup for the first time in North America. DETROIT -- Chrysler Group will show off two vehicles at next month's Detroit auto show hinting at future collaborations under Italy's Fiat S.p.A, according to two sources familiar with the plans. • An electric version of the Fiat 500 minicar. • A Lancia Delta mid-size hatchback with a Chrysler grille. Chrysler has no immediate plans to sell either of the vehicles in North America, said the sources, who declined to be identified. CEO Sergio Marchionne plans to gradually merge the Lancia and Chrysler brands. They are both under the guidance of brand CEO Olivier Francois, appointed in the aftermath of Fiat taking control of the U.S. automaker following its U.S.-steered rescue and bankruptcy this spring. A corner of Chrysler's stand will also be dedicated to showing vehicles from Fiat's luxury-sports brands, the Ferrari 458 Italia and the Maserati GranCabrio, the sources said. Chrysler spokesman Gualberto Ranieri declined comment on what vehicles the company might show. He confirmed Chrysler is not planning a press conference because the company has no new production vehicles to show. Chrysler executives, including Marchionne, will be on hand for interviews during the primary media preview day, Jan. 11, Ranieri said. In addition to the electric version of the 500, Chrysler will display the entire Fiat 500 lineup for the first time in North America, the sources said. 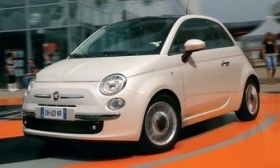 Included will be the 500C cabriolet, scheduled to go on sale in 2011, and the sporty 500 Abarth. Abarth is Fiat's performance brand. The 500 hatchback, previewed in April at the New York auto show, will go on sale in the United States in late 2010. Chrysler will build the 500 for North America at its plant in Toluca, Mexico, beginning late 2010. Initial capacity will be 100,000 units a year -- half of them destined for North America and half for Latin America. The 500 will be powered by Fiat's 1.4-liter FIRE engine, for “fully integrated robotized.” Engine output will range from about 100 hp for the base model to about 175 hp for the turbocharged version destined to be the Abarth sporty model. Chrysler will build the FIRE engines in its Dundee, Mich., plant beginning in the fourth quarter next year. At 139.6 inches, the four-passenger 500 hatchback is 33 inches longer than the Smart ForTwo.